Electrostatically charged adhesion slides with excellent adhesive properties for high reliability in instrument based applications. For tissue slides 2-5um thick. Eliminates background staining in standard H&E stains. No background staining occurs when immunoperoxidase or in-situ DNA procedures are performed. Available in white, green, pink, blue and yellow. The surface is positively charged, but is characterised by optimised tissue adhesion when in-situ hybridisation techniques or immunoperoxidase procedures with heat-induced antigen/epitope retrieval (HIER, HMAR or HTAR) are required. For tissue slides 2-5um thick. Eliminates background staining in standard H&E stains. Binds difficult cytological preparations. Electrostatically and biochemically adhesive slides. The preparation is first adhered by electrostatic attraction and then fixed in place by biochemical binding. 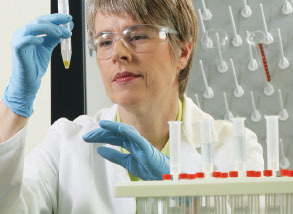 Polysine offers adhesion that is superior to glue, protein or silane treated slides. Polysine adhesion slides are best suited to paraffin-embedded tissue slices fixed in formalin, alcohol or Bouins solution. For tissue slices 2-5um thick. These slides feature a revolutionary glass adhesion technology that first attracts and then chemically bonds fresh or frozen tissue slices to their surface. They are particularly suited to poorly adhesive tissue samples (bone, breast and brain) that are larger than 5um. Assists adherence during IHC analysis of estrogen and progesterone receptors in fresh frozen breast tissue.